Lock in a great price for Perivolas Hotel – rated 9.5 by recent guests! Exquisite. Luxururious. Romantic. Relaxing. Breathtaking view. Privacy. Seclusion. Beyond our expectations. Wish we had stayed even longer. Absolute perfection. Couldn’t recommend anything. Will most definitely be back and will tell everyone we know to stay here. Thank you for the most incredible stay. The Perivolas is truly a special place. The location is ideal. 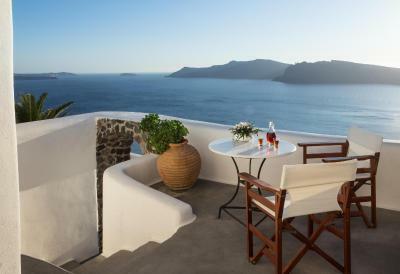 The distance to the crowded center of Oia is a short and easy walk, but the hotel is set apart enough from the bustling hoards of tourists to be truly a retreat. 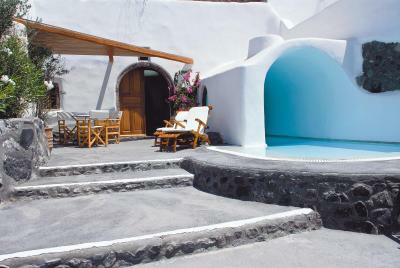 The view of the caldera from the pool was mesmerizing, and the rooms are luxurious, cave-like havens. The hotel even kindly upgraded us for our last night. The staff members were extremely attentive but never intrusive, and they made our stay exceptional. We couldn't have asked for a more magical place to spend our 11th anniversary. 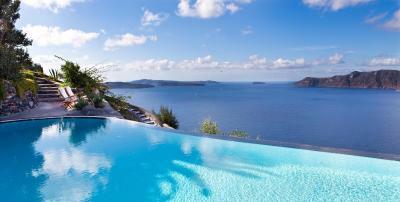 The pool was an amazing, location is GREAT! and the food was wonderful! The staff by far makes this property amazing. Thank you so very much! Everything!!! Best service, excellent food, incredible care about all details! Fastest responses to any requests. The staff went above and beyond for all our needs and even for additional items we didnt even ask for! Staff was fantastic. Food was excellent. Room was comfortable. Loved it. Perivolas Hotel This rating is a reflection of how the property compares to the industry standard when it comes to price, facilities and services available. It's based on a self-evaluation by the property. Use this rating to help choose your stay! 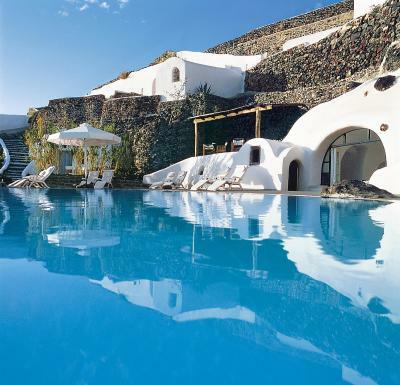 This 5-star hotel, offering an infinity pool with magnificent sea view, is located on the cliffs high above the Aegean Sea, a short walking distance from the picturesque Oia. 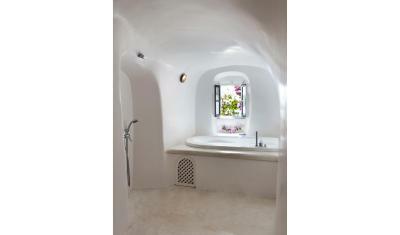 The hotel features 20 private houses in restored 300 year-old caves. Each suite enjoys free Wi-Fi internet access and a comfortable seating area. The wellness center features a steam bath, sauna, open-air hot tub and massage facilities. The 24-hour fitness center allows guests to exercise while taking in views of the cliffs. 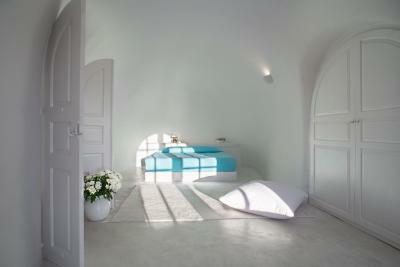 When would you like to stay at Perivolas Hotel? 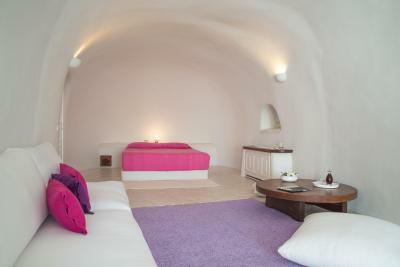 This spacious suite features white-washed walls and includes a seating area with an open-plan or separate bedroom. 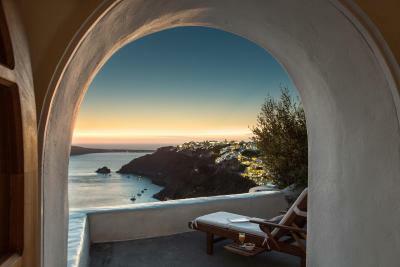 It opens out to a terrace with views over Caldera. 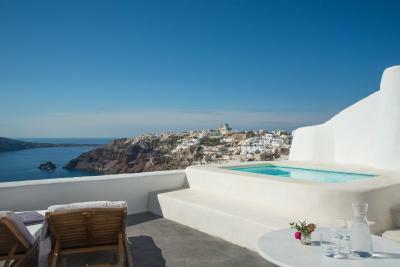 Overlooking the Caldera from its private terrace, this suite features white-washed walls and antique furnishings. 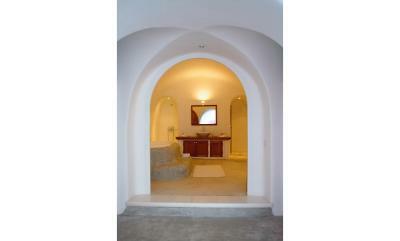 It includes an open-plan seating area with a bedroom, and a bathroom with stone-built walls. 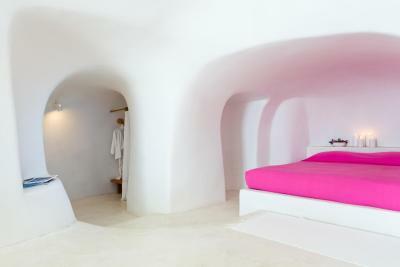 Studios are traditionally carved into the landscape, offering an open-plan seating area with a queen size bed. 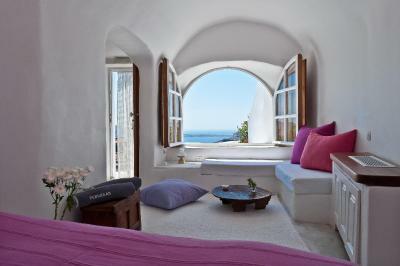 It features hand-made cotton rugs and cushions with vivid colors. 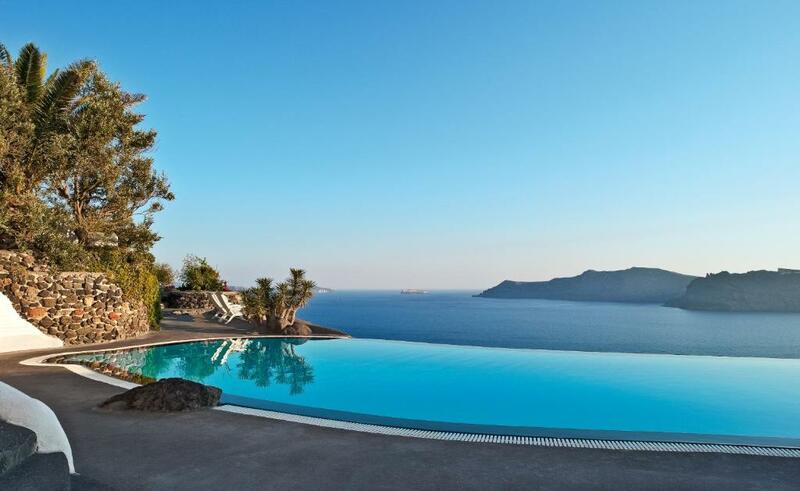 The terrace offers views of the Caldera. 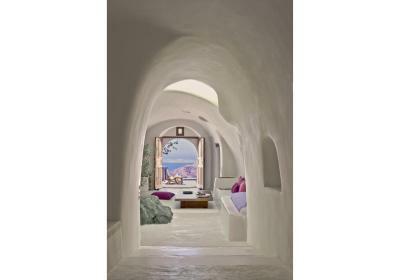 Offering a spacious terrace with sea views, this suite features white-washed walls and smooth curves, a bedroom, a seating area and a bathroom carved out of Santorinian stone. 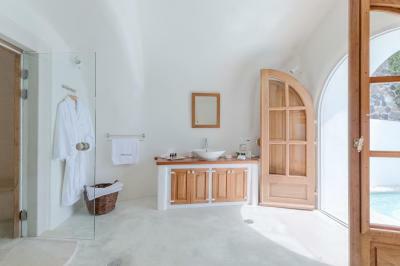 Featuring an arched open-plan interior with a built-in bed and seating area, this suite has an outdoor hot tub. 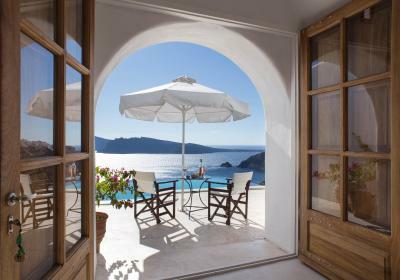 The private terrace overlooks the Aegean Sea. This suite has a semi-private bedroom, a separate, spacious living room including a king-size bed and a luxurious bathroom with steam room. 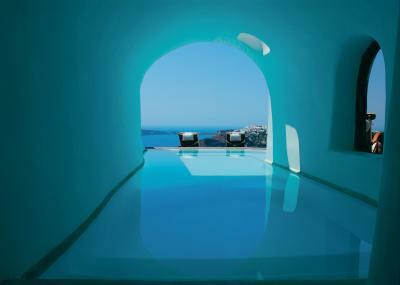 Its terrace has a panoramic view of the Aegean Sea and features a heated pool with hydromassage jets. This suite includes a separate bedroom with attached bathroom with a double bed and a spacious domed living room with a king-size bed. 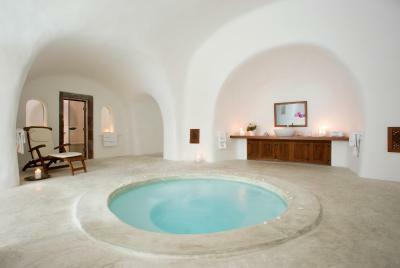 It offers spa facilities with a steam bath and a hydrotherapy massage pool. The caved, heated swimming pool opens out to the terrace with Caldera views. 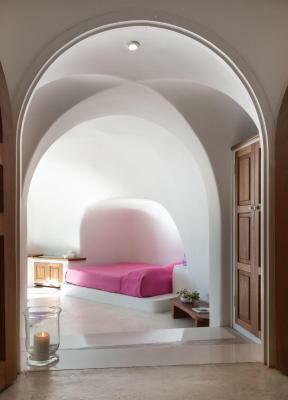 This cave-carved suite, once the home of a local winemaker, is characterized by whitewashed walls and smooth vaulted ceiling in the bedroom. 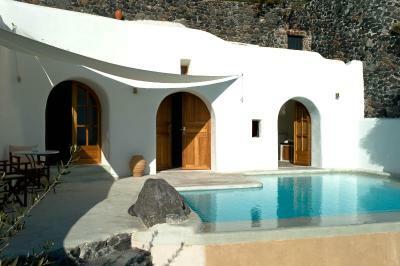 It includes a spacious living area which is decorated with handwoven rugs and cushions and a terrace that features an infinity pool, which appears to merge with the Caldera a thousand feet below. Perivolas transmits the ideas of freedom and essence of living, revealing the abstract quality of something that is invisible. Simplicity is not only aesthetic value, but it has a moral perception that looks into nature for the essence and reveals the inner qualities of the island. 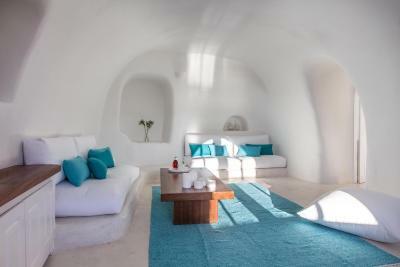 With 20 unique accommodations, Perivolas provides the ultimate in Aegean luxury. 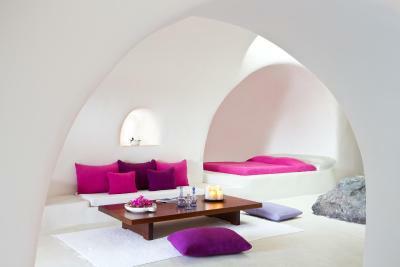 It observes the antiquity of traditional cave architecture, the opulence of the island, and the intrinsic beauty of the Aegean offering individual accommodations, each with their own charming personality and flair. 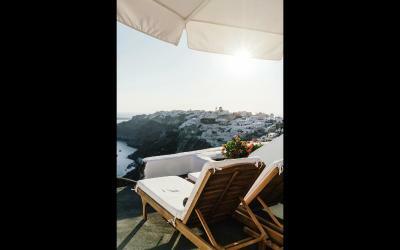 House Rules Perivolas Hotel takes special requests – add in the next step! 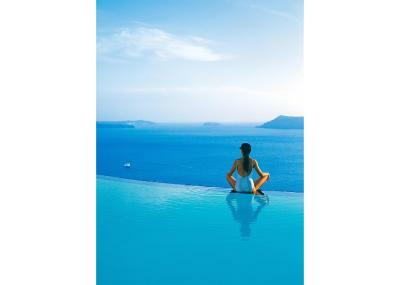 Perivolas Hotel accepts these cards and reserves the right to temporarily hold an amount prior to arrival. Nothing. This was a perfect stay. We could not find fault with anything during our stay. You can always find small details but nothing really worth a mention. I know it's a hotel built into the side of a cliff on a hot island, with a jacuzzi in it, so I should naturally be forgiving of insects but there's quite a lot of mosquitoes and ants.